OK, so the letters look more like bills, and Mr. Bennet looks more clueless than surprised, but maybe he’s really bowled over by the thought that his dear Lizzy is about to become Mrs. Darcy! 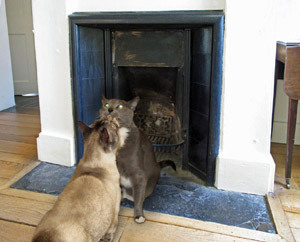 The problem was that after thinking it over, the initially-enthusiastic agent had second thoughts about the logistics of photographing cats in Regency settings, or came up with a vision for the book that had little or no relationship to ours. 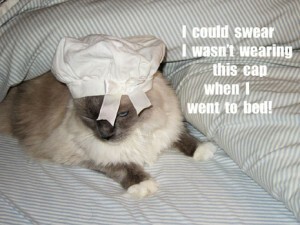 Though dressing cats up is not our thing, we occasionally took the liberty of putting a cap on a cat (pictured here is the late Mittens as Mrs. Bennet). More photos, more interest, and many more rejections. This period went on for five years and an undisclosed number of agents. 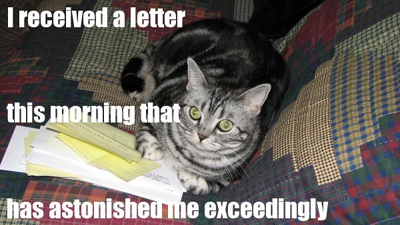 We did get an interested agent who sent our proposal out to a few publishers. One major publisher said they would consider publishing the book if we could perfectly reproduce scenes in P&P with cats dressed in Regency costumes. This was not going to happen. First of all, you can’t make cats do anything they don’t want to do. The pictures would have been hilarious, but not in the way the publisher imagined. Secondly, this was not our vision for the book. 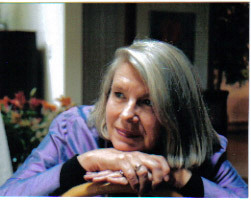 We wanted a book that juxtaposed cats being cats with Jane’s wit and verve. To us, the juxtaposition was the joke. Eventually, with very little fuss or fanfare James McGinniss took on the book and sold it shortly afterwards to Skyhorse Publishing. Debbie and Annelise (Pamela’s daughter) on the way to a cat-photo shoot in Portland, 2006. Luckily, at this time, Pamela’s good friend, author and photographer Sally Keehn, set out on an “English Literature on Location” tour in the UK. The tour focused on several authors, including Thomas Hardy, Charles Dickens – and Jane Austen. 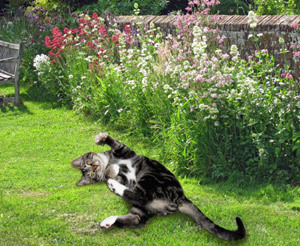 Sally agreed to take photos of Austen-related settings for us to Photoshop the cats into. 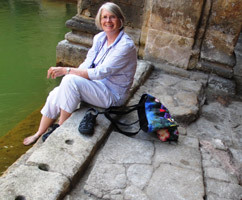 Sally at the Roman Baths (in Bath) where Jane Austen lived from 1801-1806,. Her novels Persuasion and Northanger Abbey are set there. The last piece of the puzzle was provided by the incomparable graphic artist, Kathryn Hathaway (http://hathawaydesignsnw.com). 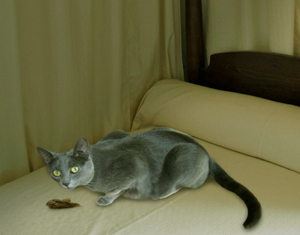 Kathryn Photoshopped the kitties into many of Sally’s settings, which is why we have a photo of Elizabeth throwing up a hairball on Jane Austen’s actual bed in Chawton. “What’s crazier than working with two Austenite-cat-lovers? 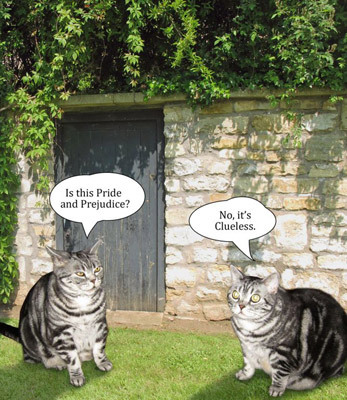 I’ve known Debbie Guyol for years and met Pamela Jane when she came up with this totally loony idea of putting cats as characters in Jane Austen’s Pride and Prejudice. They both came out to my place to photograph the neighbor’s cats. Then came playtime, placing cats into Regency backgrounds or putting two cats together in a room via Photoshop. There were weekends taking shiny 21st century toys out of cat’s paws and replacing them with hairballs or some bit of a lace hanky. Kathryn places a kitty on Sally’s photo of the wall and garden of Chawton, where Jane Austen lived from 1809 until her death in 1817. We Finally Figure Out How To Do It! 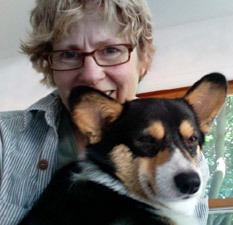 Long ago, Pamela miraculously acquired a two-story office. Debbie flew to Pennsylvania for the let’s-put-it-all-together phase, and the downstairs office became our staging area. We worked all day every day for weeks: writing and revising, scouring the pages of Pride and Prejudice, then painstakingly matching photographs with chapters and with quotes, and when that didn’t work, making up silly captions for photographs. We settled our artistic disagreements with duels. Or horse-trading. 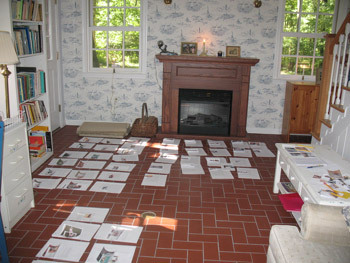 After Debbie flew back to Portland, we spent another full month refining the text, discovering that the cat we thought would fit perfectly into one of Sally’s wonderful authentic settings was all wrong for it, taking more pictures, making lists, horse-trading – well, you get the idea. Yes, we did it. We figured out how to do it, in the end, simply by doing it.